Lines in the garden can be used to lead the eye and focus the attention of the viewer, or they can be employed to physically guide people through a space. Lines create focal points and influence the mood of the landscape. Different ways of using lines in a landscape have Different effects on the emotions of the people viewing them. 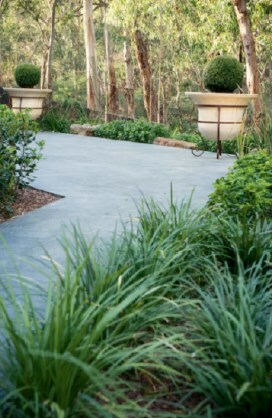 Lines are also critical to creating a sense of structure and developing the aesthetic appeal of a garden. for a subtle formal touch. - Straight lines: These give a structured, ordered and purposeful feeling. On the other end of the spectrum, curved flowing lines throughout a landscape result in a calmer mood, which can feel more natural and soothing; even more welcoming. -Long straight lines: For a strong impact, use long straight lines. They draw attention directly to the point at the end of the line. Such lines can either be utilized for effect and to introduce a sense of drama or softened with interruptions to the line. - Lines with sharp angles: Sharp angles, including zigzags, can give an impression of energy and excitement. But in the wrong place, particularly when used in small spaces, they can create tension. - Crossing lines: To create interest and draw attention to the intersection point, use crossing lines. It resembles the “vanishing point” that is created on the horizon, which is a sight commonly seen when traveling along long straight roads or paths. -Circular lines: A circle or oval can give the impression of enclosure and a feeling of being embraced or surrounded by the landscape. Circles draw the eye into and around them, like the lines in the center of a flower that direct bees where to land. a relaxed and inviting look. Lines can be created with hard landscape elements such as paving, retaining and garden walls, planters, sculpture, water features, ponds and pools, arches and structures such as pergolas. 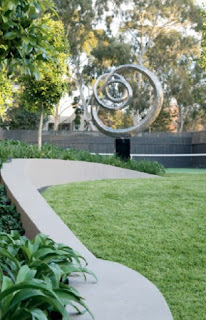 Lines are also formed by soft landscaping, including plants, branches and water, as well as shadow and light. Lines can be used to attract attention towards a feature or to distract the eye away from an unpleasant element. Lines can be used to take you on a journey from one focal point to the next, either physically or visually. The interior and exterior lines of the house can be considered within the landscape so when viewed through windows, the vista is accentuated within your property to draw attention. When there are dominant line styles in the existing architecture, or the surrounding buildings, the lines of the landscape need to be integrated harmoniously. This can be done by contrasting the line style or complementing it. Angular architecture can be softened by the style chosen for the landscape, or the sharp angles can be echoed in the lines and surfaces of the landscape. Man-made structures often have many lines, which can lead to a melange of conflicting angles. Without care, the effect can look haphazard. Nature, on the other hand, tends to blend one object (a boulder, tree, creek) into another and lines only emerge where different natural element start and finish. If you have multiple lines crowding a space, there will be a sense of movement and busyness. If there are fewer lines in a large space or an area of heavy texture, it can create a calmer feeling and ensure that the lines have a greater design impact. You also need to consider the spacing of lines. Random spacing results in a more relaxed look while regimented lines give a sense of order. Consider your garden’s viewing points. Where will the landscape be viewed from: a doorway, looking down from above, a deck, the street? Also consider how you might frame these viewing points by using lines.